Question: How can we get a boiled egg in and out of a bottle without breaking the egg? If it starts to get hot put off the flame or drop it in the large bin. Air pressure is playing games in this experiment. The match inside the bottle warmed up the air inside and increase the pressure of the air. If you look closely you will see the egg bounce a little that is the air under high pressure trying to escape. But as soon as the match goes off and the bottle starts to cool down the pressure inside the bottle starts to drop, pressure and temperature go together. 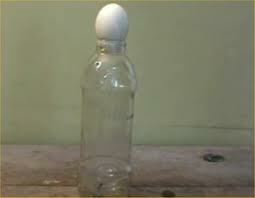 The egg on top closes the system and as the pressure continues to drop a vacuum is created and an imbalance of pressure occurs between the inside and outside of the bottle. The pressure outside is higher and given that there is a vacuum inside it is easy for the pressure outside to push the egg in. Basically we do the reverse, we increase the pressure inside the bottle, and the higher pressure again pushes the egg in the other direction. In the case of the dry ice, it sublimates, phase change from Solid to Gas, the gas fills the container and increases the pressure and pushes the egg. In the case of the baking soda and vinegar, it creates a chemical reaction that also generates a gas, the same gas of the dry ice : carbon dioxide, and the added gas does the same as before - this way is just more messier :-) There are other ways to get the egg out can you think of them? Basically by cooling the bottle we try to drop the temperature inside the bottle and therefore drop the pressure inside to have the air pressure in the outside push the egg in. Did you like our experiment? I am in 5ht grade with Joe in Mr B's class, prefer Lacrosse and love science and writing. What Joe is not telling is that he finished 3 eggs at the end of Science Night - he also was hungry - We loved science night!